For 35 years and counting, the Toyota 4Runner has been proving its capabilities both on and off the road. As one of the last remaining truck-based SUVs with a proper body-on-frame construction design, 4Runner comes into its own when the going gets rough. With impressive rear storage and an available roof rack providing cargo flexibility, and available Multi-terrain Select and Crawl Control systems providing high-tech off-road ability, 4Runner is one serious practical adventure machine. Its repeated ability to tackle nearly any terrain means this rugged SUV has the chops to forge its own path ahead. TRD Pro gets a number of enhancements for 2019, including FOX shocks, roof rack, LED fog lights, silver skid plate with TRD letter inserts, JBL®5 audio, moonroof and black hood scoop insert. Plus, an available Voodoo Blue exterior color option is new and exclusive to TRD Pro. A new Nightshade Special Edition rounds out the 4Runner lineup with unique exterior and interior black accents. Available in three exterior colors – Midnight Black Metallic, Magnetic Gray Metallic and Blizzard Pearl – Nightshade Special Edition completes its premium look with 20-in. black wheels. TRD Pro and Nightshade Special Edition are limited to only 5,000 units each per year. 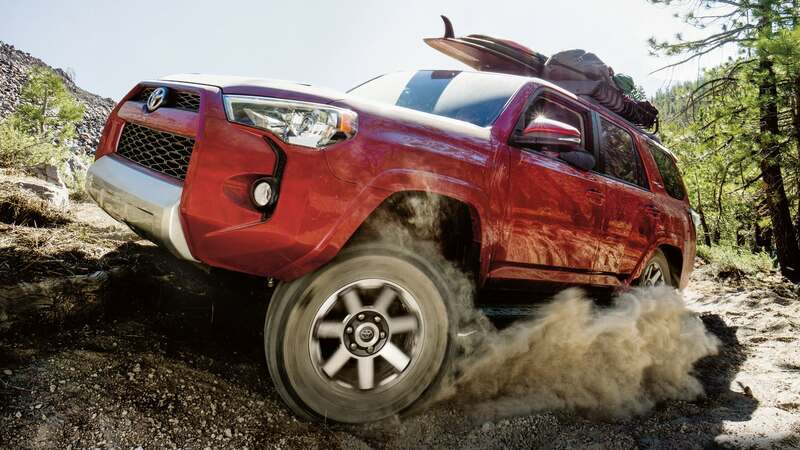 4Runner relentlessly delivers no matter what obstacle comes its way. With standard mud-and-snow tires and impressive ground clearance, it goes without saying that this SUV is more capable than your average grocery getter. But as a Toyota, it’s perfectly happy grabbing groceries day in, day out if that’s what’s asked of it. 4Runner’s ability to outperform in both urban and off-road1 environments is highlighted by its legendary reliability and durability, as well as some seriously noteworthy long-term cost estimates.